Hope you all have a great year. I hope I do too. No pages to post in this sitting but I hope there are plenty for the year. I feel so bad. I really have no idea who this guy is. I was just looking through an album & I liked the photo. Not sure if this was from a show or a rehearsal. The date on the photo was 1986. I used the Time Flies December Scraps of Darkness kit. I did add the Dusty Attic music piece & the embellies from my stash. Well, I am about done with this kit. It is a great kit. I have really enjoyed the mojo I had to work on this book. This was taken in 1988 for some flyers when they would play. I used the December kit Time Flies to make this. Well...I was bored yesterday. This being sick thing is for the birds. But I did get a lot of scrapping done. This photo was taken at On The Rocks on October 31, 1988 of Joey C Jones playing with his band Shock Tu. He was a fabulous frontman. He could rival any signed band out there. I used a combination ot the November & December Scraps of Darkness kits. I hope you like it. OK, so have I told you I really love the November Rain kit from Scraps of Darkness? Well I do. I took this photo at On The Rocks back in 1989 when Naked Zoo was playing. In the photo is Scott Snow. He was the lead guttarist for the band. He really had a lot of hair. I used an old guitar pic but it was pretty used & dull so I used an old Making Memories rub on & put the "S" on it for Scott. Then I colored over it with alcohol ink. I love the hat pin Mandy (craftysprinkles) made so I used it as well. TFL. Well, the real world wasn't ready for me yet. I was not cleared to go back to work till Monday. So after moping around a while, I started scrapping again. I did this page wtih the December kit "Time Flies". I also used Craftysprinkles sketch. The photo is of my Mom. 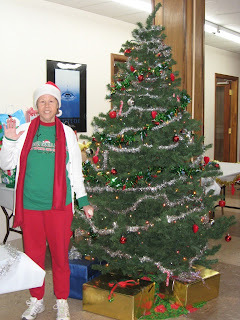 It was taken at her last Christmas party at work. She loved Christmas. This was the way she dressed during the Christmas season. Below is the original color photo. One more then back to the real world. I am on a roll here. I truly love this kit. Again, done with the November Scraps of Darkness kit November Rain. Photo is of another friend from Spider Ranch taken in 1989 at On The Rocks. Thanks again Mel for putting this kit together. Another page using my Scraps of Darkness November Rain kit. This is Steve. He was in the same band as the person in the last post... Spider Ranch. I used the cricut cartridge Indie Art to cut out the spider & the Old West cartridge to cut out the Ranch. Kind of still needs something I just don't know what it is. Scraps of Darkness "November Rain"
I did this layout for a contest at Scraps of Darkness with the November Rain kit. I love this kit. It brings back so many memories. Back in the 80's I hung out & worked in a nightclub in Dallas called On The Rocks. I absolutely loved this place. It was such a fun time in my life. I still love the music & keep in touch with so many of the guys. This particular photo was taken of a singer Ryan Skeen who was in the local band Spider Ranch in September of 1989. I picked these papers because they brought out the colors in the photo. I haven't been here in a while, I think about it all the time just lazy I guess. Christmas Tree went up in November before I went on my trip to Dallas, I had a great vacation. Got to see my family old friends, re kindled an old friendship & met a new one. My Grandmother was so happy to see me. I just love and adore her, always have. She is so sweet. She is aging now, getting shorter but she still looks wonderful. These were taken at her house on Dec. 2. I got to see her several times. Isn't she sweet. I was her first. Mommy used to tell me Grandma was at the hospital with her & Daddy when I was born. Grandma told me this one day while we were talking about birthdays. This is all for now. My fingers are cold. It is in the low 20's & the rest of me is warm, I just meed to get my hands covered.